Jessica with two of her music collages-turned photographs. 2017. JESSICA LEVANT is a native San Franciscan who spent 30 years living in New York and London. When she returned to the Bay Area in the late 90s, she re-designed her career and therefore the rest of her life. As an artist, she is mainly self-taught, though has availed herself to various classes in painting and photography over the years. She defines her Photo Art as ‘unexpected views of the ordinary and ordinary views of the unexpected’. She is drawn to shapes, juxtapositions, shadows and white space – and visual irony, mostly in urban settings. She has an eye for and a penchant for the quirky. In the late 90s she started a graphic and web design business, pulling together art interests and fascination with computers. Over the next few years, her passion and developing skill with the endless possibilities of digital manipulation finally took her into the joyful world of fine art. She is now combining her art with her other passion, jazz. She has documented Bay Area jazz musicians in two photo books, and often is called upon to photograph bands or individuals. Some of her projects incorporate music themes into her fine art, using both camera and mixed media. 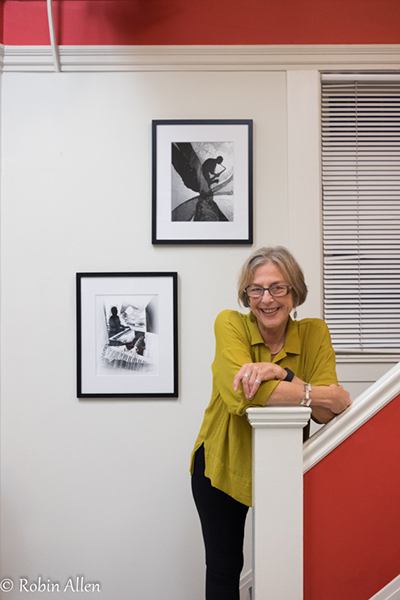 WHERE TO SEE THE WORK: Her photo art has been regularly accepted in the monthly juried shows at the historic San Francisco Women Artists Gallery (647 Irving Street, San Francisco). Over the years her work has also been shown at various Bay Area galleries and shows (See a full listing here).